The eight members of the Courage to Live Foundation are pictured along with the staff and a few of the patients from the Center for Neurological Development in Burkettsville. 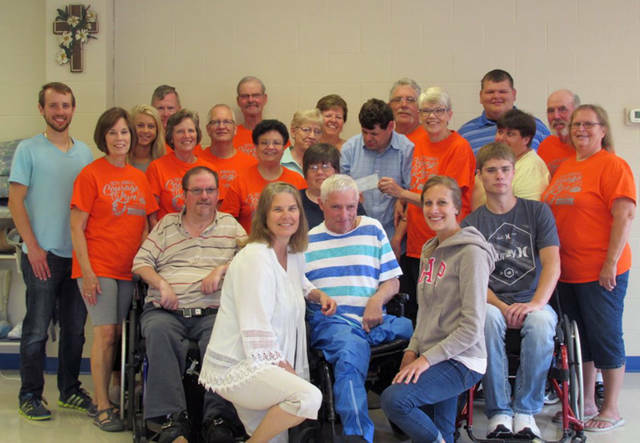 BURKETTSVILLE – The Courage to Live Foundation recently presented a check in the amount of $34,000 to the Center for Neurological Development in Burkettsville. The donated money will assist in the day-to-day operations of the nonprofit organization. All patients at the center are evaluated and assisted at no charge to the patient. The Courage to Live Foundation co-sponsored a benefit weekend in July with the Wendelin Sports Club. The weekend concluded with the annual Walk of Courage, entertainment and a raffle of 64 prizes. The foundation members thanked all the area businesses and individuals who donated money, prizes, food, drinks and their time to the organization to help make the benefit a huge success.